SEVENTY-FOUR Kabwe Municipal council workers have been suspended with immediate effect for allegedly participating in the illegal three-day strike action last week. In a statement today, council assistant Public Relations Manager Waluka Mwaekwa said the strike action was contrary to provisions 40.4 paragraph (c, d and e) of the Conditions of Service for Division IV of 1996 as read with the Schedule of offences and penalties in the Local Government Service. The workers have been charged with the offence of riotous behavior, acting violently and omission which intentionally endangers the health or safety of others. The workers in Division IV have been given two days and those in Division 2 and 3 have been given seven days respectively from the date of receipt of the letters to exculpate themselves and show cause why disciplinary action should not be taken against them. Kapinga told newsdayZambia.com today that the union leadership was trying to sort out the issue with the relevant authorities. And acting Town Clerk Joel Shawa has also charged and suspended the Senior Health Inspector, Director of Planning, Director of engineering Director Housing and Social services and Chief Human Resource Officer for inefficiency. This follows the failure to carry out work and complete the set assignments to the standards without reasonable cause in respect of the Keep Zambia Clean green and healthy campaign. Shawa with guidance from the Local Government Service Commission has charged the directors with the offence of inefficiency in accordance with Paragraph 62(c) of the conditions of service for division I,II,II of 1996. The suspension has been instituted due to the gravity of the offences committed. “Therefore, the affected Directors and workers will be on suspension until the disciplinary process is completed,” read the statement. Over the weekend, President Edgar Lungu expressed disappointment that the Kabwe Municipal Council had failed to deal with huge heaps of garbage. 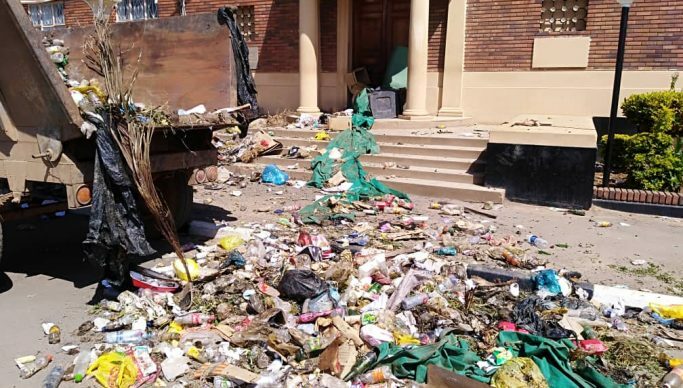 Earlier, aggrieved council workers dumped garbage from refuse trucks at the entrance of their offices after some PF cadres attacked them for carrying out a protest to press for their salaries. Meanwhile, Zampost Management has issued suspension letters to 12 of its workers for participating in a countrywide sit-in protest over unpaid salaries. According to some Zampost workers who spoke on condition of anonymity for fear of victimization, the 12 include Kitwe branch ecretary, Kabwe branch chairlady, a trustee from Lusaka branch and nine others all from Lusaka Province. And the workers have told the media that the decision by management to issue suspension letters was a violation of human rights and one way of intimidating them and force them to go for work without pay. The workers also felt their union leaders had failed to protect them as they are allegedly being controlled by management. Zampost offices in Kitwe, Chingola and Chililabombwe districts on the Copperbelt Province and other provinces have been closed by unionized staff in protest of their unpaid 7 months salaries.